Whether you’re looking to lose weight or hit that elusive PR, an active metabolic test (VO2max) will give you the quantifiable information on your metabolism that you need to achieve success. This scientific approach takes all the guess work out of your programming, yielding efficient and effective results helping you to be Lighter Leaner Stronger Faster! These variables can highly affect the outcome of the test!! By investing in your Active and Resting Metabolic assessments, you’ll gain insight into your personal metabolism. You will receive detailed information about your caloric needs and how your body burns fat. You’ll know, from a sound, scientific perspective, what your body requires to operate at its best. 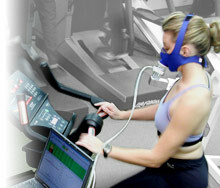 Please click here for VO2 Metabolic Test Info Sheet. Whether you’re training for a half-marathon or honing perfect abs, learning more about your personal fitness ability and capability can help you achieve your goal. Your New Leaf metabolic assessment and profile gives a precise look at how your fitness efforts affect your body’s inner workings. With science-based, performance-level technology, the metabolic assessment provides you with specific measurements: how efficiently your body burns fat, at what heart rate you begin to burn less-efficient carbs, the efficacy of your breathing during workouts, and more. The insights from your New Leaf assessment and profile are used to create a fitness program that will train your metabolism to perform at its highest level. And New Leaf’s Active Metabolic Training, ultimately, is the science-based secret to carrying less fat, building more muscle, and attaining your ultimate fitness goal. What are you really capable of? To achieve your body’s full potential, you’ve first got to know what that potential is. At the highest levels of sport, we measure potential in Peak VO2. How much oxygen can your body take in and use in the process of burning fuel (calories) to perform at the highest level? New Leaf’s Metabolic Assessment precisely measures your aerobic base, your threshold, and your peak. With that vital information in hand, you can put together a workout plan that will put you in pursuit of your full potential. If you’ve experienced the dreaded DNF, your anaerobic threshold is a likely culprit in the dubious “did not finish” distinction. With a metabolic assessment, you can know without doubt what changes you must make to your base conditioning and interval training to bust through the tape. For athletes who need explosive power, say for quick sprints up and down the court, quick aerobic recovery means a better chance of beating your competitor off the line. With a metabolic assessment, you and your trainer can build your aerobic base for optimum performance. Contact BreakAway Performance to schedule a Resting Metabolic Assessment, an Active Metabolic Assessment or both.